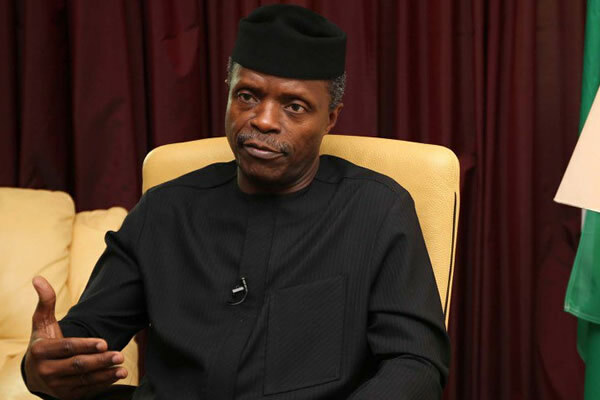 Vice President Yemi Osinbajo on Saturday said the Federal Government would not relent in its efforts at ensuring peace in crisis prone areas of the country. Osinbajo, who was represented by the Administrator, Aso Villa Chapel, Rev. Peter Ambi, said this during the National Peace and Leadership Summit organised by the Youth For Peace and Good Leadership Initiative International in Abuja. The theme of the Summit is `The Role of the Youth in Nation building’. He said peace was important for any peaceful development in the country, saying the killings in parts of the country must stop. “Nobody is happy about the killings in parts of the country, this administration is working to ensure that peace is restored to those communities. “The killings in mosques, churches and other public areas for one reason or the other must be stopped,’’ Osinbanjo said. He called on the youths across the country not to allow themselves to be used to cause havoc in the country, saying the youths should be peace ambassadors. The Chairman of Christian Association of Nigeria (CAN), 19 Northern states and FCT, Rev. Yakubu Pam, said the religious leaders are tired of conducting mass burials in affected areas in the country, saying there should be quick intervention. “ We need people with different and positive thinking and not people who think of vengeance,’’ he said. The National Chairperson of the Women Wing of CAN, Mrs Oyin Sowoolu, advised the youths to use their talents positively to move the nation forward, adding that the role of youths in the country should not be undermined. The Founder of the Youth For Peace and Good Leadership Initiative International, Mr Simon Dolly, said the purpose of the summit was to educate the youths as they were mostly the key actors of social vices in the country. Dolly said the youths should be able to complement the role of government in ensuring peace and contribute their quota in nation building. He said the summit would be replicated in the six geo-political zones in the country, saying that the youths would be given certificate as peace ambassadors of Nigeria in order to encourage peace in the various areas. One of the youths at the summit, Stella Francis-Utah, said the youths needed to contribute to peaceful coexistence, adding that they should stop thuggery and any form of violence. The Role of the Youth in Nation building’.